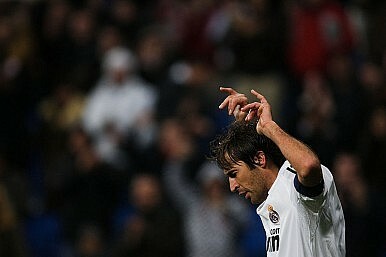 Football legend and former Real Madrid star Raul is heading to Qatar. Can he help give Qatar a global presence? There have been some big name soccer stars heading to Asia recently. And none of them are bigger than Raul. The striker may be 34, but he’s still capable of playing at the highest level. He has just come off two seasons in Germany with FC Schalke and helped the club to the semi-final of last season’s UEFA Champions League. He’s scored a very creditable 36 goals in 86 appearances for the club since arriving in the summer of 2010. He made his name though, of course, with Real Madrid. The word legend is thrown around too lightly in sport, but there’s no other way to describe him in connection to the Spanish giants. Nobody has played more than him and scored more than him for the nine-time European champion. In 15 years, he appeared 741 times and scored 323 goals. It’s an astonishing record. Now, though, he’s in Qatar after signing for Al Sadd. The team from Doha is currently the Asian Champion and is hoping to go to the next level, and they see Raul as a way to make that happen. Before the announcement was made, Raul talked of spending time in a less competitive league. Compared to the rigors of the big European leagues with 34, 36 or 38 league games, there are only 22 in Qatar. There’s no playing in sub-zero temperatures or the driving rain, wind or snow either. It makes for a laid-back environment for any veteran. After signing for Al Sadd, Raul revealed that he had talked to just-departed Barcelona coach Pep Guardiola about football in the country. The man who delivered unprecedented success to Barcelona in the last four years also spent time as a player in Qatar. He’s also hoping to help the country’s football scene. Qatar will host the 2022 World Cup and is desperate to appear on the global stage before then. The national team has never done so before, but has reached the final round of qualification for the 2014 tournament. Raul has accomplished many things in his career, but if he can help Qatar achieve its dream, that will rank alongside all of them. Football giant Real Madrid is thinking big with a $1 billion leisure complex plan for the United Arab Emirates. World Cup Hopes Hang in the Balance for Japan, AustraliaSendai: A Tale of Football and HopeShinji Kagawa’s Historic Hat-TrickThailand’s Makudi to Run for AFC Presidency Japan: A Football, Rugby Powerhouse in the Making?